Oena Shoes - a thin AE#02 last, a sharp toe area, and AE-Gel system sole for better precision and feet placement on the board. Shoe's last: AE#02 - thin with a sharp toe area, for better precision and feet placement on the board. 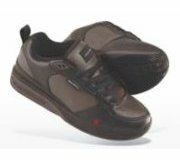 Shoe's sole: All Rubber type with AE-GEL® System ground contact with cushion. Shoe's upper Features: Triple stitched reinforcing toe area. Rubber underlay on the ollie area. Lace saving system on the ollie area. Elastic tongue straps absorbing insole.